Rovio‘s next popular mobile game and successor of the most popular Angry Birds, Bad Piggies is now available in different mobiles platforms as well as in Windows PC. If you own a Samsung Galaxy Y, have you tried downloading the game via Android apps? 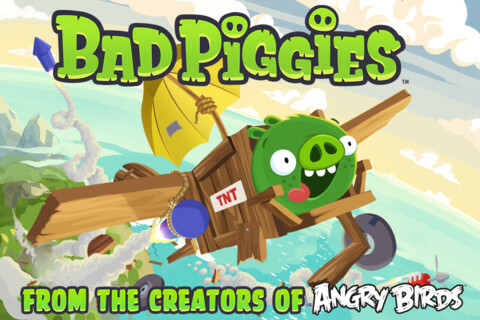 Did you notice that Bad Piggies did not appear on your Google Play Store on your phone when you try to look for it? 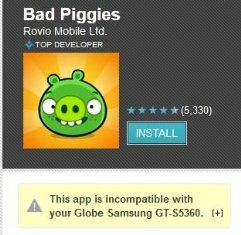 And when you try to download Bad Piggies via Web, you can not download it, saying that the game is incompatible with your phone. Isn’t it frustrating? Even though, Bad Piggies was created by the same company Rovio and it looks like the graphics is similar to Angry Birds, it seems that Bad Piggies requires a more powerful mobile processor/GPU for you to play it properly. Well, there are ways on how you can play Bad Piggies on Samsung Galaxy Y but those are already re-programmed or re-configured Bad Piggies APK files that forces the game to run on Samsung Galaxy Y or in other entry level smartphones, even though the phone did not met the game’s minimum system requirement. You can try to look for and download Bad Piggies ARMv6 APK files on the web. But just a warning, those are not official APK files by Rovio. It’s not even listed on Google Play store. They might contains ads or spyware or something who knows what. Download the modded game file at your own risk. 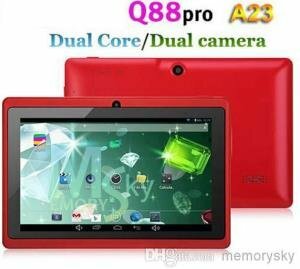 I tried to install one on a Galaxy Y, and surprisingly it worked. But the problem is, the game runs very slow. It’s like running in 10-20 fps only. The game is playable but you won’t enjoy it.